If you find that your hardwood floor isn’t looking like it should or acting like it should, then you may have a problem. If your hardwood floor is bowing, then you need to know a couple things like the cause of the problem and the way you can repair it. In terms of excessive moisture, it’s actually one of the most common reasons for a bowed floor. It may be caused by a burst pipe, a flood, inadequate heating, poor ventilation, etc. It may also happen if you didn’t prepare your sub-floor and let it dry out properly, before you actually install the wooden floor. You can stop this by applying a liquid membrane before you install it. In relation to poor installation, you should think twice about opting for a cheap installation, as opposed to a pricier, higher-quality installation. For instance, poor installation may not leave an adequate gap for the wood to expand into or they don’t cut door frames. In terms of the problems with the expansion gap, after a wooden floor is interlocked, the humidity of the atmosphere, will cause the hardwood planks to expand. You need to consider that there are expansion rates which are relative to the humidity and the temperature. 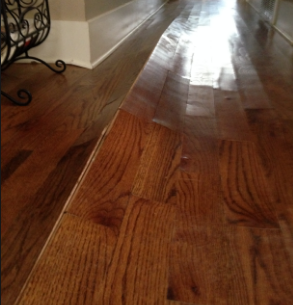 We’re going to show you how to repair your hardwood floor when you realize that is has begun bowing. First off, you need to identify the areas where the floor is bowing to figure out where the floor is butting against the perimeter. You have to figure out the reason why it’s bowing as well. Check the humidity level of the room and use a dehumidifier if the air is too moist, particularly depending on the time of the year. You can fix the small bows if you simply wet the bowed area and place a very heavy object on it. If the bow is very large, you will have to remove it and replace it.